An update on the HG basic trainer project. First I'll comment on the incredible number of views this subject has received. My guess is that some search engine is listing it under some version of "hang glider training". So , most of those views were probably from people searching for HG training sources (actually that's good news in itself) not people interested in a new design to make training easier. Now for the update: After the successful test glides of the scale model the project has been in limbo for several reasons, including my being busy with other things. Also I haven't received a reply from WW on my request to buy some components from them. And, a big holdup is that I don't have enough room in my shop to spread out a full size hang glider. I can make parts but not construct the glider from those parts, in the space I have. The other thing is getting someone with the talent and capability to commit to making the sail for me. I would prefer WW for that since I will use Condor 330 rib battens and Steve P already has experience with that high camber and maybe even some software from the Condor that could help with the sail design. So, there it is folks. I encourage anyone who thinks this design is a good thing, to step up to the plate, if there is something they can do to help this project along. I can cover the financing, that's not a problem. This is an open source project, I do not intend to have any commercial interest or financial gain. It would be nice to get credit for the design ideas, if someone does pick it up eventually. BTW - Andy Beem has already committed to being the Dockweiler test pilot if it ever gets built. Thank you Andy! Frank Colver wrote: BTW - Andy Beem has already committed to being the Dockweiler test pilot if it ever gets built. Thank you Andy! I don't think you'll ever need to worry about test pilots ... at least not at Dockweiler. I'm setting up an account at Wills Wing to buy tubing and other components to build the prototype. There is a possibility that Steve Pearson could make the sail for me but it's still a long shot, depending on how busy he is at WW when i'm ready for that final part. It appears that there is enough of the light weight sail material, left over from the Condor production, to cover this glider. BTW - This thread has had so many readers that I thought Google might be linking it to searches about "hang gliding basic training". I searched and looked at all of the Google links and this wasn't one of them. Why so many looking? Maybe it's in another search engine. I just wanted to bump this topic with a post since Chopper Girl was asking about plans for a simple minimalistic glider. That's not exactly what Frank has proposed, but it's closely related. I also wanted to add the recently adopted name of "Puffin" to the topic since that name wasn't in use when the original concepts were being discussed. So for all you search engines out there: Puffin puffin PUFFIN PuFfIn pUfFiN PufFin and P-U-F-F-I-N.
First, and most importantly, I think it's great that people like Frank keep thinking "out of the box" to improve the sport. The freedom to explore outside the box in glider design is part of our American aviation heritage. Having said that, I've had two concerns with the design presented here. I've kept them to myself largely because I didn't want to give the impression that they might be based on politics. But since I mentioned them to Mike Grisham on the phone today, I'd like to share them here. My first concern is for the structural integrity of the outboard tip struts. They are relatively long and are responsible for holding tension on a good percentage of the deep chord section. I think this will be problematic both in maintaining tension and in resisting torque. My second concern is glide performance. Glide performance is obviously a secondary concern for this glider. But if the performance isn't sufficient to get off the ground in moderate winds at sites like Dockweiler, then that will largely undermine its utility as a training glider. I wouldn't place any bets on my concerns and I hope they might inspire appropriate investigations and/or modifications to dismiss them. Bob Kuczewski wrote: My first concern is for the structural integrity of the outboard tip struts. They are relatively long and are responsible for holding tension on a good percentage of the deep chord section. I think this will be problematic both in maintaining tension and in resisting torque. Sail tension will mostly be supported at the crossbar ends, not at the wingtips. The rearward part of the leading edge and the ribs will only carry the span-wise loads outside of a line drawn between the sail tail and the crossbar ends. These parts may need stiffening, shortening, a diagonal brace, or even a sprog to help carry that load, but it probably won't need much, if anything, there. For clarity, the Comets used a "diagonal brace" to carry the span-wise loads at the wingtip, in the form of a strong straight rib inside the sail, pivoting at the leading edge spar. That pivoting may be limited if desired, by using a bracket instead of a ball-in-socket. Wingtips do not generate much lift with HGs. For a trainer, they may be more handicap than help, making the wing more unwieldy to the beginner pilot. Luff lines can replace the pitch stability "lost" with the missing long wingtips. I like this design for a lot of reasons now, and I do not doubt that future development will improve on the prototype. Lead ON !! There is a 45* diagonal brace located at 50% of the tip chord to transfer tip inward load to the LE where the sail is pulling inward in nearly 90* direction to the tip. Basically using sail load at one place to support sail load at another place. The forces will not be equal but every little bit of support helps. I'm not sure that everyone has noticed that diagonal tip brace on the drawings. I didn't put it on the model because the model is built with excessive strength. Glide ratio: The glide ratio will definitely be better than the rogallo and many of them flew from Dockweiler in the old days. The model had a better than expected L/D but there were no flying wires, a control bar, king post or pilot adding drag. If the model had a poor glide without those things i probably would have stopped right there. The model looked especially good when it entered ground effect on the beach but with the low aspect ratio there won't be much of that with the full scale version. Only Andy, Josh, and I have seen the model fly after I got it trimmed with enough reflex and a far enough forward CG (30.5% of MAC) plus firmly attaching the sail to the battens (it pulled loose the 1st time out). I will be increasing the tip positive angle to get enough reflex on the full scale version. It was only +5% on the model and I had to bend the fifth batten to increase it. Thinking of +15* on the big one but also thinking of having several angles (20* & 25*) that can be changed without modification of the structure. I would like the Cg to be about 25% of MAC for good pitch damping so a student wouldn't feel like it was too sensitive to fore and aft weight shift. This glider isn't going to be making any speed runs! Red wrote: Sail tension will mostly be supported at the crossbar ends, not at the wingtips. Take another look at the drawing. The crossbar ends ARE at the wingtips. The outboard rails will need to maintain similar tension as the crossbar or the sail will have a "gutter" running from the aft keel point to each tip (where the leading edge meets the crossbar). Red wrote: Wingtips do not generate much lift with HGs. They may not generate much lift themselves, but their presence extends the spanwise distance that the high pressure under-surface air must travel to reach the lower pressure upper-surface regions. Think about what winglets do. Winglets don't generate much lift, but they improve the performance of the rest of the wing. The full size version (if it's ever built) will be the final arbiter. 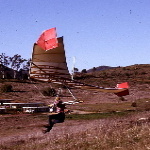 I am all for anything that helps grow the sport of hang gliding. But when a prospective student walks up to the beach and watches Andy or Josh lift off effortlessly, and fly along the ridge what do you think the prospective student is thinking most? That looks too hard to turn. That looks too heavy to carry. One hundred bucks ... for only 4 flights!?! Imagine the difference if people could just walk up and try it for free. ... with any glider. As I said, I'm in favor of anything that grows the sport of hang gliding, but some things will be more effective than others. I am extremely disappointed that the desire to gather support for this "Puffer" has led to silence in defending USHGRS. I sure hope this glider is a star or I'd hate to be among those who put the "Puffer" ahead of USHGRS. We should just keep building the USHGRS until the database is so complete and available to everyone that it will promote itself. The utility will be self evident. It will become the go to website for information and video links to other pilots. It will be so valuable that nay Sayers will clear all doubt in the minds of most pilots that the hidden agenda is no longer hidden.